Feeding your dog a balanced raw diet is the best way to improve their health. That includes reducing allergy symptoms like itching and hot spots, and creating a glossy shiny coat. So if you’re thinking about adding raw food to your dogs diet, good idea! Your dog is an amazingly complicated animal that is carnivorous by nature - just look at their sharp pointy teeth or the way their digestive system works. But thanks to 30 000 years of living with people, dogs are also able to get nutrition from other sources like table scraps, vegetables and even dry biscuits! A processed or plant based diet is a long way from proper nutrition though, to be truly healthy your dog needs fresh meat. Protein is digested with hydrochloric acid, which means it needs a low pH (acidic) environment in the gut. This also creates a natural barrier to the harmful pathogens, and provides the best conditions for digestive enzymes to work in. This acidic gut means a slower digestive process than for kibble or carb-based diets. The length of time food spends in a carnivores stomach is generally about 4-8 hours, compared to around 30 minutes in an omnivore. 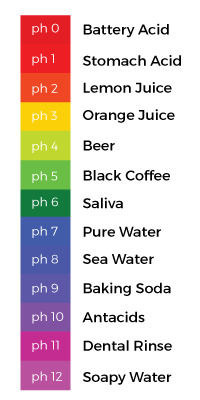 Your dog’s stomach naturally has a pH of between 1 and 2. However if it's fed processed food that increases to 4 or 5. The carbohydrates actually inhibit stomach acidity, making it difficult for your dog to digest the protein it needs. This is why some dogs have problems eating raw food, and why it’s really important to properly transition to raw. If you want to feed both raw and kibble, it’s much better to feed them separately. That is because they actually require different digestive processes. The first step is to get your dog used to raw food, as suggested here. Then feed raw days and kibble days separately, to maximise digestive function. It might feel better to top up the kibble with fresh food, but it’s putting unnecessary pressure on your dog’s digestive system. Obviously, it’s significantly better to be feeding an all raw diet. Your dog's stomach just can’t adjust it’s pH fast enough for the optimal digestion of both. We know that this can be difficult though (especially with bigger dogs), so remember it’s always better to have some raw, unprocessed food as many days in the week as possible.